Children “lived in the dark like rats” while Daesh ruled in Mosul, an aid worker claims. Many of them had hidden from the terrorists and the ensuing war to retake the city. Consequently, they are suffering from rickets, a lack of Vitamin D and are very thin. “I dream of a woman with blood all over her face,” murmured one girl aged about 10 or 11. A boy was present when his cousin was offered a cigarette by a Daesh fighter. When he accepted, they shot him in the back. Mental health adviser Dr Marcia Brophy interviewed children from Mosul and noted that they rarely smiled and spoke of being afraid of an unidentifiable “thing”, “person” or even “monster”. Their behaviour was “robotic” and lacking in any emotion, according to Brophy. This is the classic profile of children who have been bombarded with horrific images and lost parents and friends. At the Hammam al-Alil camp outside the city, youngsters aged from 10 to 15 said they had seen family members killed before their eyes. They had also witnessed the beheadings and lashings that were part of everyday life under Daesh. One 13-year-old boy recounted the grotesque spectacle of dead bodies hanging on iron bars for days on end. Unsurprisingly, the children do not believe that Daesh has gone for good. Like an evil character in a fairy story, they think it could return at any moment. Charity workers asked children to put anything they wanted into an imaginary “magic bag”. They often chose “sadness” and “Daesh” as objects they would like to dispose of. An 11-year-old said she saw people murdered by Daesh in the streets. “They denied us everything, even playing”. Her own brother was killed before her for allegedly passing information to the Iraqi army. Testimonies like her will emerge a lot more as the city is retaken. There were an estimated 600,000 children living in Mosul and Nineveh province under Daesh rule. Education provided little by way of intellectual distraction. Arts and sciences were shelved in favour of a very narrow theological curriculum reflecting the Daesh version of Islam. While many parents claim they removed their sons and daughters from school, most will have sent them out of fear for the consequences. Children often found themselves at the forefront of the terrorist insurgency. They were used as human shields by Daesh and in one case, a female suicide bomber blew herself up with a baby in her arms to deflect suspicion. She pretended to be a mother fleeing the city but then detonated the device as she passed by Iraqi soldiers and civilians. 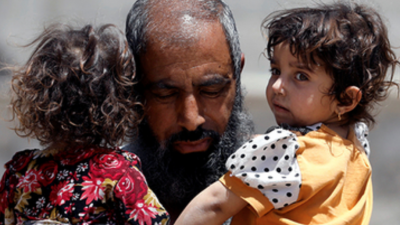 At least 30,000 children were born in Iraq under Daesh. Their births were registered by the terrorists so for now, they will be effectively stateless. The school age generation emerging from Daesh rule will struggle with their own identity as they attempt to integrate into the rest of Iraqi society. Part of the necessary healing process will be to find their place in Iraq and begin to erase from their minds the horrors of the early years of their lives.